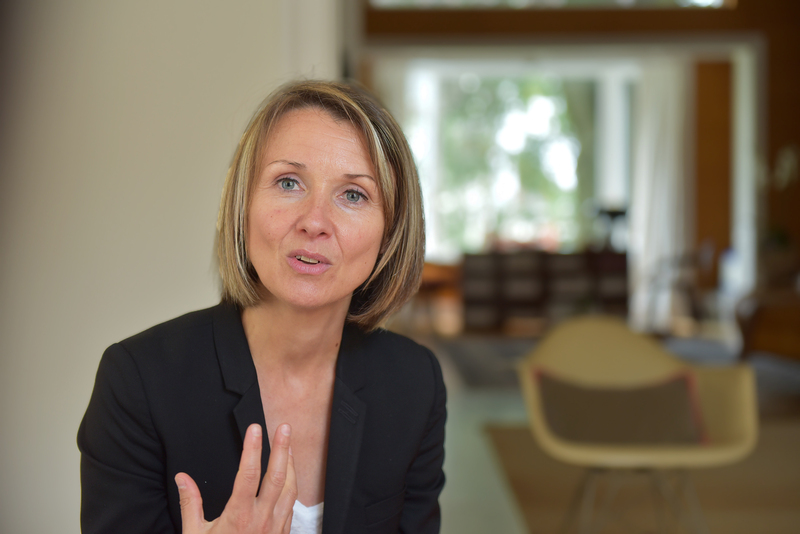 Séverine Frerson. Photo: Marc-Pieter Devos, mdmedia & partners, 2018. 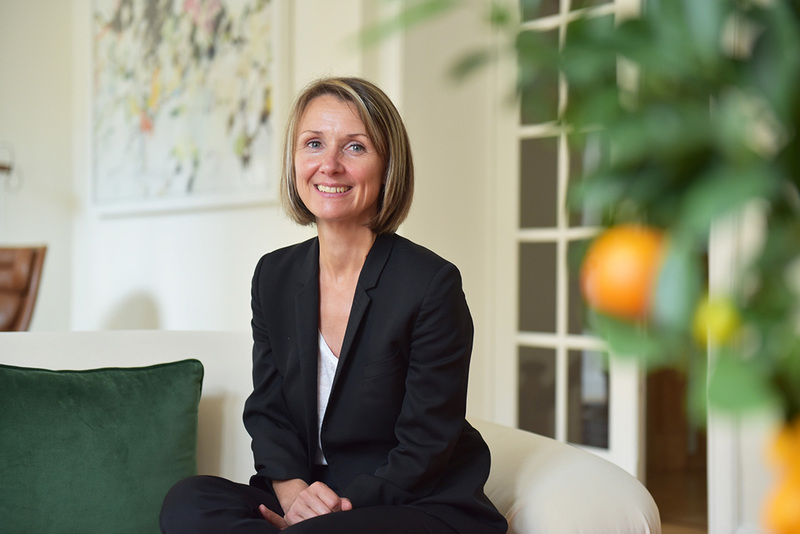 It was announced a while ago: Séverine Frerson, until then adjunct cellar master alongside the celebrated Régis Camus, has been appointed the new chef de cave of the famous champagne house Piper-Heidsieck. 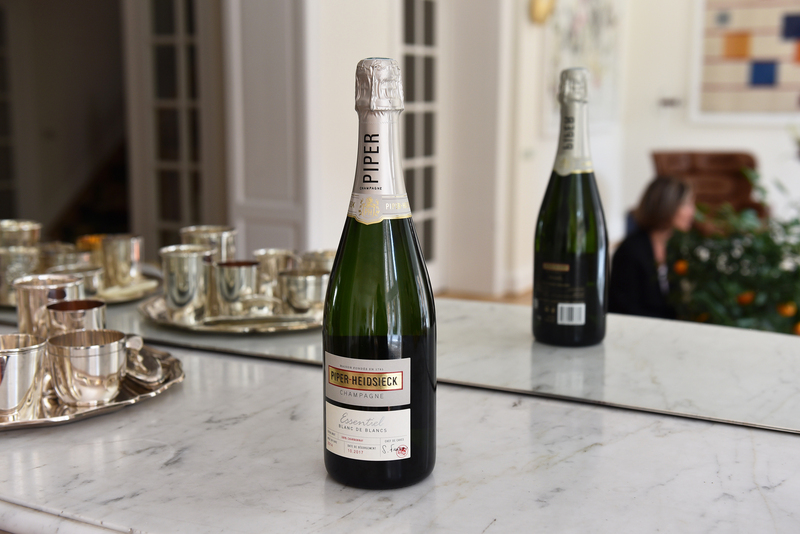 Now it is up to her to preserve the brand’s rich history and the style and quality of Piper-Heidsieck champagne, ànd to guide the house through changing times and markets. 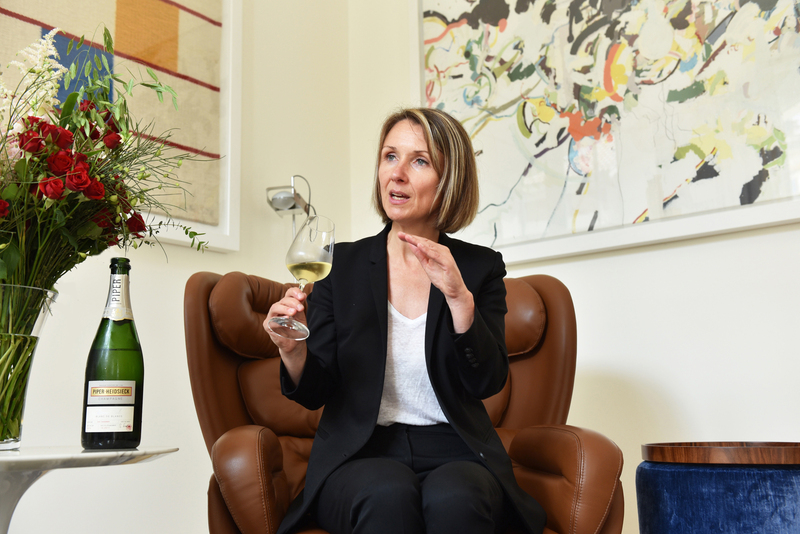 She recently visited Brussels to present her new cuvée Essentiel Blanc de Blancs, and we met up for a delightful talk – and an equally delightful glass afterwards. KB: Bonjour Séverine. Right off the bat, a small question: how does one become cellar master of a renowned champagne house? SF: (laughs) I don’t think there is a specific ‘one way’. In my case, I’ve been an oenologist at Piper-Heidsieck for 16 years now, following vinifications and tastings throughout the years. But in the beginning I mainly worked on HQSE (Health, Quality, Safety and Environment). At that time, Rémy Cointreau wished to get a certification for its 3 French sites, so I worked on obtaining the ISO standard 22000 for food safety. Right after, I continued with environmental standards. But since the end of 2011, beginning of 2012 I have returned to the heart of my profession: oenology, vinification, assemblage, etc.. In the cellar as well as the lab. KB: A lot has changed in those 16 years. How did you see the house evolve? SF: Truly much has happened. The style of our wines for example has gradually been adjusted since the beginning of the 21st century. We started working with Pinot Noir from the Côte des Bar, which gives a lovely fruity character and a beautiful structure to the champagne. Wine that brings a smile to your face. So the blend has been adapted, and from there, step by step we have evolved to a more subtle, precise style of champagne. KB: And do you plan to continue along those lines? SF: Absolutely. I want to concentrate even more on working the reserve wines. With an emphasis on complexity and precision. Structure as well. 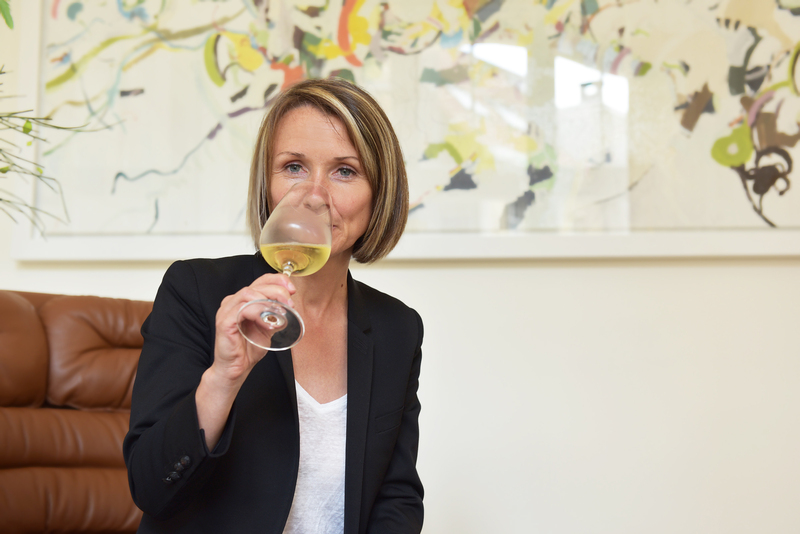 KB: Something I’ve often noticed with female sommeliers or chefs – and it won’t be any different with female oenologists – is that interviews tend to focus on the fact that we are women, rather than on our professional capabilities. Does that irritate you? SF: It doesn’t irritate me at all, because it is part of the complete picture. I do expect the question every time, though (laughs). It is true that there are fewer women active in champagne – it’s a hyper-masculine world, but it’s gradually becoming more feminine, so that’s good. Because there aren’t many jobs that can only be done by men. Or women. To the contrary, we need both. Our team of oenologists for example consists of 7 people, of which 2 are women. During tastings we are very complimentary. KB: Do you notice a clear difference? SF: Definitely. Men and women tend to approach tasting and blending quite differently, and that’s what makes us richer. It’s what drives us forward, and we need to preserve that interaction. Regardless whether the cellar master is a man or a woman… (smiles). KB: In champagne and in wine in general, we recognise a strong trend towards authenticity, towards personality in a product. Is this also noticeable in a renowned and established champagne house? SF: Certainly. Authenticity is what makes one stand out. Therefore we have the range ‘Essentiel’, which launched in 2012. These aren’t champagne wines to be found just anywhere, but rather a niche product for connaisseurs, wine merchants and restaurants. And currently we are working on ‘Essentiel By’, co-signature champagnes based on our blend, for which we work on the liqueur d’expédition together with a restaurant chef in order to personalise the cuvée. KB: Do you also experiment with the other grape varieties that are authorised in champagne? SF: That we don’t. We work the 3 varieties Chardonnay, Pinot Noir and Pinot Meunier. On a personal level, I do enjoy tasting the old and other grape varieties, because they are part of the history of Champagne. Whether it’s Arbane or Petit Meslier. There’s a wine producer quite close to us, who only works with the ancestral varieties, and I like that a lot. It’s part of our patrimony, and we shouldn’t forget them. KB: Is it possible they could play a more important role in the future, e.g. because of climate change? KB: What are in your opinion currently the biggest challenges for champagne – the wine and Champagne – the region? SF: The changing climate. We adjust to the climatic circumstances, but for example 2017 has been a challenging year in Champagne. It’s important to remain flexible and vigilant in caring for the vineyards, and finding the optimal harvest dates. Because it differs from village to village, variety to variety and zone to zone. We may need to be a bit more practical here and respect that the winegrowers know their vines best and let them decide when is the best time to harvest. KB: And oxidation / bottle consistency? Do you for instance use jetting? SF: We do, and we have very good results when it comes to effervescence as well as oxidation. It also helps to calm the bottles when they are a bit nervous, and it allows the bottles to evolve in a more consistent manner. Less heterogenous. So yes, we use it for sure. KB: Do you with all your responsibilities still have time to visit the vineyards yourself? SF: I do. At Piper-Heidsieck, 6% of the grapes come from our own vineyards, and 94% are bought in. But even for the part we purchase, I work with our partners and visit the vineyards. Throughout the year, not necessarily just for the harvest. KB: From the entire process of viticulture and winemaking – which is your favourite part? SF: Without any doubt: assemblage. I love everything about my job, but making the blends gives me most satisfaction. How it involves all my senses to taste the different wines, and then relying on my memory and intuition to create a synthesis of all the work that has preceded. I find intuition is essential here to choose the wines: to feel which one will contribute a certain character or originality. It transcends technical tasting. KB: Do you work in a similar, intuitive way to pair food and wine? SF: I do. It works best for me. Experiencing tastes and textures when I taste a wine, like I do during assemblage, that’s also what I find in food dishes. Texture is very important – I believe that pairings are mainly made based on texture and mouthfeel. KB: Do you consider champagne more as an aperitif or more as a meal partner? SF: Both, because the offer is so diverse. Some cuvées are made to be an aperitif, others work best with food. And finding the right combinations is very rewarding. I like that, those subtle accords and contrasts, also when it comes to aromas. Browsing through the library of impressions and knowledge you have in your head, looking for the missing link that adds value to both the wine and the dish. KB: Which is the most magical, surprising food and wine pairing you have ever tasted? SF: For Piper-Heidsieck that is with the Rosé Sauvage. Traditionally a rosé champagne is often served with desserts, but with Piper we wanted a more audacious rosé, which diverts from the classic, rather light-hued rosé. Our rosé is almost ruby red, and matches perfectly with meat dishes. A beautiful piece of spiced beef on the barbecue, for instance. Or duck à l’orange. It’s important to dare to experiment. KB: And which pairings don’t work for you at all? SF: Brut or Extra Brut champagnes with a dessert. For desserts you need wines with a higher dosage. Wine and food should complement and strengthen one another, otherwise it’s just a shame for both. KB: Do you have a preferred vintage in champagne? SF: I adore 1988. Champagne has many great vintages, but 1988 was monumental. 2002 was a gorgeous vintage as well, with a very sunny summer. And 2008 was very good for Piper-Heidsieck as well. This vintage is available now, and expresses the year’s conditions in a lovely and virtuose way. KB: In which kind of setting do you prefer to drink champagnes like these? SF: I highly value the right atmosphere for enjoying champagne. I’m thinking about a historic house with high ceilings, a library, armchairs in worn leather, a whiff of cigar in the background… With just a small number of people, intimate and cosy, and classical music in the background. KB: Are you still able to simply enjoy champagne, without thinking, without analysing? SF: That has become difficult. I do consciously try to. For instance when I’m with family or friends, I just want to enjoy the moment, the pleasure of sharing valuable time together. But they don’t always make it easy for me: ‘So, Séverine, what do you think about this one?’ (laughs). And on a subconscious level, it’s always difficult to let go and not think about what’s in your glass. KB: Last but not least: is champagne to you mainly a technical wine or a wine of the heart? SF: (long silence) I’d have to say ‘wine of the heart’. Champagne is above anything a wine to share, a wine with a smile, a wine which brings joy. And also during the technical process of assemblage, I use my intuition and my emotions. Technique is necessary, but it’s not paramount. Champagne Piper-Heidsieck Cuvée Essentiel Blanc de Blancs by Séverine Frerson. Photo: Marc-Pieter Devos, mdmedia & partners, 2018. The first cuvée signed by Séverine Frerson, and based on how I got to know her during this interview, I have the impression her first fully-fledged champagne baby is already a true expression of her personality: amiable and elegant, yet bolstered by a strong backbone and enriched with a sunny, playful, vivacious character. Essentiel Blanc de Blancs is a Chardonnay champagne full of temperament, which harmonises bright, ripe orchard fruit (apple, pear and a hint of peach) with delicate floral touches, an undercurrent of brioche and heady gingerbread spices. The low dosage (extra brut) showcases the wine’s lively acidity beautifully and adds a refreshing and refined structure to the champagne, which balances the spicy notes and creates tension and a sense of wonder in the long, gracious finish. An enchanting champagne that makes you dream about the next sip – and then another one. Séverine Frerson, cellar master at Champagne Piper-Heidsieck, with Kristel Balcaen, Champagne Ambassador, Belgium 2018. Photo: Marc-Pieter Devos, mdmedia & partners, 2018.